The metal-clad Stylus Tough 8000 features sealed gaskets and screwed-on armor that protects its 12 megapixel sensor, 3.6x optical zoom, and 2.7-inch LCD from the elements. At 6.4 ounces, it’s more than an ounce heavier than its handsome cousin, the Stylus 7000 ( ), but that’s the price you pay for toughness. The Tough 8000 is waterproof to 33 feet, freeze proof to 14 degrees, and will keep on snapping photos after being dropped from a height of 6 feet. When you press the power button, the metal lens cover slides down, revealing the picture-taking lens that is protected behind weatherproofed optical glass. Water seals are visible in other places too, such as on the inner edge of the LCD and inside the hinged covers for the battery compartment and the USB connector port. If you like the feel of durability, then you’ll have a hard time setting this camera down. Unlike some of the other Olympus compacts I’ve tested, the Tough 8000 zoom accommodates a wide 28mm focal length and extends to 102mm on the telephoto end. The broad angle of view is very handy for underwater work and landscape photography. 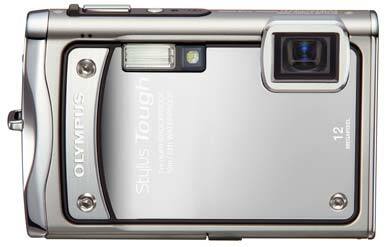 To make it easier to control the camera in extreme conditions (such as while wearing gloves or snorkeling), Olympus included Tap Control for some of the basic settings. One tap on the right side of the Tough 8000 lets you change the flash mode; a tap on the left puts you into Macro mode; a tap on the LCD switches to Playback mode; and two taps on the top indicate your OK to whatever question the camera is asking you. Once you get the hang of Tap Control, it’s quite intuitive. When in Playback, for example, you can tap the left side of the camera to move to the previous picture. In shooting mode, you can tap the right side to toggle among flash modes, then tap twice on top to set the one you want. But I did have a few nits with this feature. The mini instructional page appears far too often and becomes annoying, especially while you wait for it to disappear. And the most obvious use for Tap Control, to switch among Scene modes while underwater, doesn’t work. To switch from Underwater Snapshot to Underwater Macro, you must press tiny buttons and delve into the menu system. The Tough 8000 has a 2.7-inch LCD. 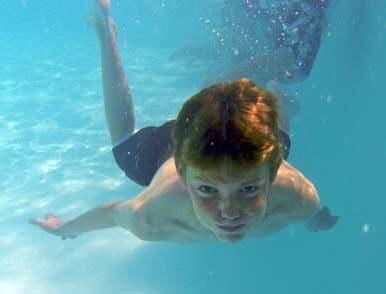 Underwater Snapshot: Your basic Scene mode for casual shooting at the beach or pool. Underwater Wide 1: Best suited for landscape capture beneath the waves--good for coral reefs, for example. Underwater Wide 2: Also makes good use of the 28mm focal length, but is the better choice for moving objects, such as fish swimming by. Underwater Macro: Perfect mode for those close-ups of coral and other ocean features. The top image is the original file capture with the Tough 8000 in a swimming pool. The image below has Auto Levels applied to it in Aperture. In all of the underwater modes, I was surprised that the White Balance compensation wasn’t better for my pool shots. And the contrast was quite flat. I loaded the images into Aperture ( ) and used the Auto Levels button to correct them. Both exposure and color were quickly fixed in postproduction, but I would have preferred better results in camera. So, yes, the camera happily takes pictures underwater, and for casual snapshooters, the results should be fine. But more advanced photographers will most likely be disappointed with lack of Tap Control and relatively dull, blue pictures that require post production with an image editor. Twelve megapixels is a lot of resolution to squeeze on to a tiny image sensor. But for the most part, the reliable Olympus optics and the TruePic III Image Processor produce clean, detailed enlargements, as long as you don’t print too big. Detail appears good up to 8.5 by 11 inches, but when I pushed uncropped prints up to 13 by 19 inches, I could easily see softness on both sides of the picture. Detail in the center remained crisp, however. ISO performance exceeded my expectations, with noise control being excellent between 64 and 100, very good at 200, and good at 400 and 800. I would avoid ISO 1600 except in situations where getting the shot is more important than image quality. Beauty Mode is a surprising feature on a “tough” camera. The theory is that the camera smoothes out blemishes and softens the shadows, rendering a more pleasing portrait. You get both the original image and a 1,200-by-1,600 pixel “beautified” version. Unlike an overall Gaussian filter that would soften everything in the shot, Beauty Mode focuses on skin and leaves the other elements in the composition alone. You do have to wait longer for processing time after each shot, so it’s not for fast-action fashion photography. But it does work reasonably well most of the time. This is useful for photographers who don’t want to attempt retouching in Photoshop. However, the in-camera results are not as elegant as what you could do manually with an image editor. Illuminated Macro Mode, on the other hand, makes perfect sense for this road warrior compact. Set the camera to S-Macro LED and the LED illuminator projects a beam bright enough to light up subjects as far as 8 inches from the camera. The pictures captured in this mode definitely had more contrast and color. This three-image panorama was captured and stitched inside Oracle Arena in Oakland, CA. Results weren't always this good, but when the Tough 8000 nailed it, the final product is impressive. The Tough 8000 has in-camera panorama stitching that lets you meld three shots together into a single extended-view image. My favorite of the trio of panorama modes is Combine in Camera 1. You take the first shot, then pan in either direction, slowly guiding a diamond-shaped pointer to an onscreen target. When you reach the target, the camera takes another shot. Once you’ve completed the sequence, the Tough 8000 builds the panorama and plays it for you on the LCD. The accuracy of the stitching was somewhat unpredictable, but when the Tough 8000 nailed the sequence, the results looked very good. The Stylus Tough 8000 is the camera you can take anywhere, from freezing European ski slopes to the tropical waters of the Caribbean. It’s a good-looking compact that feels great in your hands. The Tough 8000 provides all of the modern features you’d expect from a $400 camera. You don’t have a tremendous amount of direct control over the settings in terms of aperture and shutter speed, but there are 19 scene modes and a host of other controls to help you adapt to just about any situation. Plus, you have a few unique features too. Overall image quality is good as long as you don’t push the camera to produce big enlargements. 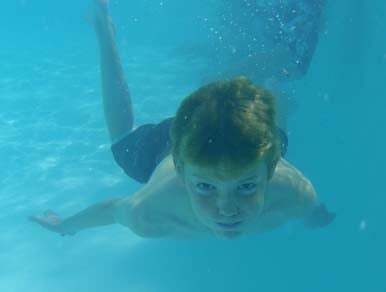 Underwater scene modes produced average results in a swimming pool, which feels like a missed opportunity for a camera designed to tame the elements. But for family vacations, rambunctious kids, and outdoor enthusiasts who want to document their adventures, the Tough 8000 will be a faithful companion.